So, let me tell you about the recent photo shoot I did called, "Resplendence". I had been going through many ideas and was starving to do something really creative. I love Levitation Photography and I had been wanting to revisit it since moving to my new home in April. I remember during unpacking that I had some Tarot cards from when I bought the game, "Dishonored" and I have never used them for anything. So, I figured I would incorporate them into this shoot. In the photos I wanted to show power or grace in the midst of chaos. 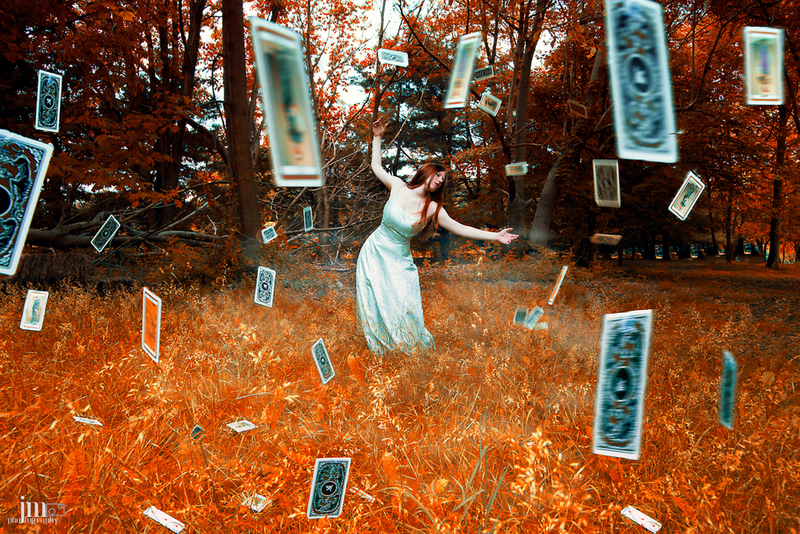 I changed the color of the foliage to a fiery orange to catch the eye and place the cards around Rebecca to draw you into her. This shoot required four people including myself. One of which was a 2 year old child who was really shy, but extremely helpful. We did the shoot in the backyard of Rebecca's home. Rebecca's backyard...well part of it. She's got a lot of land. I was working against a partially cloudy day. The sun was working against us, so we had to wait for the sun to hide behind the clouds to shoot. Luckily there were a lot of clouds. Next, I had Rebecca get into position and hit a few poses. I chose two of them and did one with her on a stool. Honestly, the one of the stool I actually wanted her on a ladder, but the ladder was too painful to hold the pose on her back or stomach and she couldn't keep her balance on it well either. Next we had to get the cards in the shot. We did it a couple of different ways. First we used a broom and tied the fishing line wire to it and then taped the cards to the other end of the fishing wire and dangled them in front of the camera. We also dropped them from being on top of the ladder. We threw them in front of the camera and lastly use a lawn blower to send the cards flying about. In the short video below you can see my process in photoshop to make the final image. I would have to say to complete the final 3 images it took me about 45 minutes each to complete. Have an idea on what the final project will look like. If your doing a photoset, remember ever step you took to get the final image. Don't rely on photoshop to do it for you. Pay attention to detail and environmental changes in the image. Well, that's how I did. Appreciate any comments or questions below. Thanks.